gracecheung604 | write on time: In the News! Lombardo’s Pizzeria and Restaurant on Commercial Drive in Vancouver is releasing a specially designed “colouring” pizza box to help mark the restaurant’s 30th year in business. 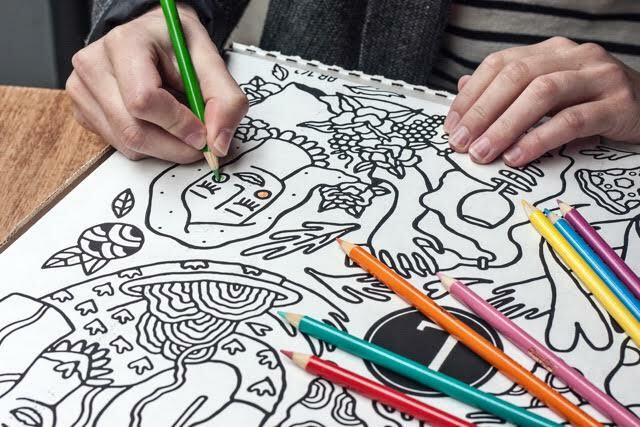 Patrons of all ages are invited to colour in the box, take photos of their creations, and share with @LombardosPizza on social media using the hashtag #Lombardos30yrs. Submissions will be entered in a monthly draw for a free large pizza, running for the rest of 2016. Lombardo’s opened on Commercial Drive and 1st Avenue in Il Mercato Mall in the summer of 1986, at the height of Expo fever in Vancouver. Despite no previous restaurant experience, Lombardo was able turn the small eatery into a local institution, serving some of the best pizza in the city. Eldest daughter Elizabeth (31) is the restaurant manager, 21-year-old Sonia helps with front-of-house, bartending and marketing, while 27-year-old Giulia is the head chef, whipping up Italian specialties since the age of five. Lombardo’s is Commercial Drive’s original wood oven pizzeria established in 1986. The family owned and operated restaurant serves traditional Italian pasta dishes and what many believe to be the best think-crust pizza in Vancouver. Located at 1st and Commercial Drive, Lombardo’s is open 7 days a week. 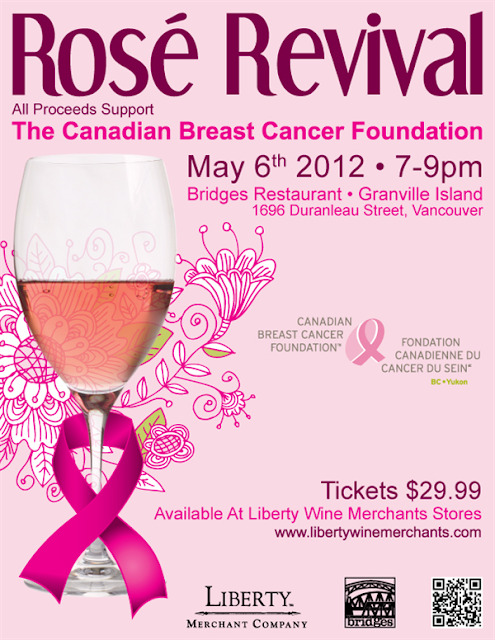 For more information or to make a reservation, please contact 604-251-2240 or go to www.lombardos.ca. Which City is More Giving, Toronto or Vancouver? 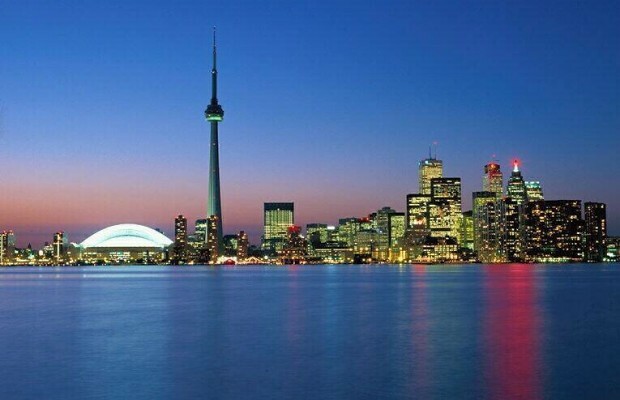 TORONTO, Oct. 7, 2013 /CNW/ - Starting today, two of Canada's largest cities, Toronto and Vancouver, are taking their civic and sporting rivalry online to decide which is the country's most charitable city. It's the Power of 2 - Toronto vs. Vancouver. There will be only one ultimate 'winner', but the real victors are the two food banks, Toronto's Daily Bread Food Bank and the Greater Vancouver Food Bank Society. All of the funds raised will go towards pro-actively working to help end hunger in our communities. "We look forward to working with the Daily Bread and sending a message from coast to coast that through collaboration, we can all play a role in supporting our most vulnerable," says Aart Schuurman Hess, CEO, Greater Vancouver Food Bank Society. "Our community is extremely supportive and we look forward to the positive impact that the Power of 2 will have on the overall health of our community." "This is a great way to raise awareness during our Thanksgiving Drive that hunger is a problem that people struggle with right across the country. And poverty is the root of that problem, so let's shine a big light on that and work towards solutions so families can afford to feed their children," says Gail Nyberg, Daily Bread's executive director. "I do feel sorry for Vancouver, though. For some reason, they seem to actually think they have a shot at beating Toronto. They're going to be very disappointed." To get this Power of 2 'city challenge' off to a great start, Investors Group has made a $15,000 contribution - $7,500 to both Toronto and Vancouver. They firmly believe in the mission and impact of both Daily Bread Food Bank and the Greater Vancouver Food Bank Society. "Investors Group is committed to giving back to the communities in which we live and work, so helping to bring attention to the issue of hunger in Canada is very important to us," said Richard Irish, Vice-President, Community Affairs and Marketing Support. "Many food banks now provide so much more than food. They offer advocacy services, budgeting information, community kitchens and employment and other training programs. The work they do is essential to the vitality of our communities and we are proud to support them." The Power of 2 is win-win-win: The charities get a big cheque to support their great work, cities get to show their civic pride, and everyone who supports the campaign will be entered into a draw to win a '5-Star Saturday' in their city. You can give and share the campaign at www.power-of-2.org. Power of 2 is a PUBLIC Inc. initiative (www.publicinc.com) aimed at unlocking the power of celebrity and communities for social good. PUBLIC is an agency, consultancy and incubator that believes everyone should profit by doing good. PUBLIC mobilizes people through innovative fundraising, advocacy and volunteer engagement campaigns for worthwhile causes. With the Power of 2, the principle is simple. Two celebrities/communities go head-to-head to see who can raise the most money for the charity that they are passionate about. The request to their supporters is to give and get two friends to do the same and see who comes out on top. To up the ante (and the fun) there is a wager on the campaign. This fall, it's Toronto vs. Vancouver, may the most generous city win! Toronto's Daily Bread Food Bank is a non-profit, charitable organization that is dedicated to fighting hunger. Daily Bread provides food and resources for people through neighbourhood food banks and meal programs in 170 community agencies across Toronto. Daily Bread member agencies see a monthly average of over 63,000 client visits and provides 3,000 nutritious meals a week that are prepared in our kitchen. We know feeding people struggling with hunger won't solve poverty; that's why Daily Bread does more. We work to support people by providing job training, researching and educating people on issues of hunger and moving forward with innovative and realistic solutions that will help people break away from poverty. For more information visit: www.dailybread.ca. The Greater Vancouver Food Bank Society (GVFBS) is a non-profit organization with a mission to empower people to nourish themselves by providing access to healthy food, education and training. The GVFBS provides assistance to over 28,000 people weekly through 15 food depots and over 100 community agencies located in Vancouver, Burnaby, New Westminster and North Vancouver. The GVFBS is committed to its vision of accessible, healthy and sustainable food for all and through community collaboration, is pro-actively working to help end hunger. For more information visit: www.foodbank.bc.ca. Will this year’s winner be a luxurious rest stop tucked away in Valleyview at the Shell Super Station, the decadent lavatories at MoRoCo Chocolat or the chic-contemporary stalls of Steamworks Brew Pub? Voting begins now! The public is invited to show its support by casting a ballot for their favourite washroom online at www.bestrestroom.com/canada through the end of November as these top five venues compete to secure the most votes in hopes of being crowned Cintas’ Canada’s Best Restroom. The contest’s site takes visitors on a photographic tour of each facility and then encourages them to choose their favourite. The winner of the 4th annual Cintas’ Canada’s Best Restroom Contest will be revealed during a nationally publicized media event later this fall, and both the winner and runner-up will secure a place in the Hall of Fame. CHOP Steakhouse is a casual dining experience for any occasion with lavish loos you won’t want to miss. Upon entering the washrooms, diners are treated to an impressive eight-foot tall stone fountain carved with floral and animal artwork. The washroom takes on the same ambience as the restaurant with low golden lights and flower arrangements covering the facility. The walls and floors are decorated in warm earth tones, and the luxurious leather couches make the washroom a great spot for private conversation. Vaulted wooden ceilings complete the room as a hint of natural light peeks in overhead. Applauded for its “practicality” and raved about for its stylish décor, the women’s washroom inside Steamworks Brew Pub in Gastown has the women gossiping. Literally. Owner Eli Gershkovitch says since women quite often go to the washroom in pairs to catch up on gossip, it only makes sense to include an oversized stall featuring two toilettes and a shoulder-height partition so ladies can continue their conversations uninterrupted. The semi-private setting is popular with parents too, who say trips to the loo with the little ones are more convenient thanks to the washroom’s open concept. The washrooms feature automated, hands-free conveniences as well as polished stone and glass mosaic infinity tiles from ceiling to floor. The space is finished off with marble countertops, stainless steel fixtures and sleek wall sconces. One might just argue the life of the party is in this loo! Tapped in 2010 as the Best Green Store, the Valleyview Shell Super Station was awarded the top honour by Convenience Store Magazine for its geo-thermal heating and cooling technologies. In 2012 this road warrior’s retreat underwent a second round of renovations - this time to the women’s washroom - that garnered rave reviews. Solid alder wood doors with privacy glass panels were installed. To give the ceiling a finish to match, alder wood tongue and groove boards were mounted overhead. Recessed lights accentuate the tiled walls, which are divided by a stripe of smaller stone accents, giving this space a bright, clean feel. The sleek granite countertops and automatic stainless steel fixtures in the washroom offer an attractive balance to the warm tones of the Travertine floor tiles. Ornate carved mirrors and sparkling Victorian style semi-flush mount chandeliers finish off the space by adding a final touch of elegance. This chocolate-lovers paradise is home to a variety of sweet treats as well as a hidden oasis in the washroom’s “suites.” The women’s loos are fit for a princess, with filigree detailing, and a washbowl that sits regally on a pristine white sink top. Each “suite” is unique with its own finishing touches, including a heart-shaped, silver vanity mirror and a tea set suspended upside down from the ceiling, giving a brand new meaning to the phrase “high tea”. In the men’s suites, black and white marble covers the floor and reaches toward the black tile walls. Pops of yellow accent artwork and frames add just the right touch of colour. Chocolate isn’t the only luxury in this quaint boutique. This restaurant and dessert lounge is an indulgence for all the senses. Located in the heart of downtown Toronto, Marché Restaurant is a lively, European-style marketplace known for its fresh, healthy food prepared right before your eyes. Marché aims to satisfy your senses and provide you with a quality experience that does just that; from food preparation and service, to the detailed black-and-white décor in the restrooms. It’s all the fine details that create the refreshing ambiance. The restroom walls are lined with vertical black-and-white striped wallpaper and tile along the bottom half of the walls, complimented with white, porcelain pedestal sinks and old black-and-white photographs. Together, all the elements create a cohesive and modern-style atmosphere that is sure to leave a lasting impression. Last year’s winner of the inaugural Canada’s Best Restroom contest was the Langley Street Loo, in Vancouver. To view photos of previous winners, visit www.bestrestroom.com/canada and click on the Hall of Fame. Cintas Canada Ltd, with headquarters in Mississauga, Ontario is a subsidiary of Cintas Corporation. Cintas Canada designs, manufactures and implements corporate identity uniform programs and provides entrance mats, restroom cleaning and supplies, tile and carpet cleaning and document shredding services to approximately 55,000 businesses in Canada. Cintas is a publicly held company traded over the Nasdaq Global Select Market under the symbol CTAS, and is a component of the Standard & Poor’s 500 Index. 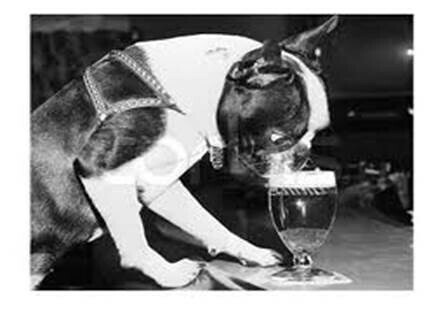 VITI WINE & LAGER STORE is holding a special Tasting Event for Dog Owners and their Furry Friends Alike! VANCOUVER, BC - September 13, 2013 – Since 2006, Viti Wine & Lager Liquor Store has been pioneering the way in craft beer retail sales in Metro Vancouver. Viti was there at the beginning of Vancouver’s craft beer awakening – being the first store to bring in such products as Sierra Nevada to BC residents - and now, Viti is bringing another first to Metro Vancouver. Viti has invited Moon Under Water Brewery from Victoria to host a special tasting event of their craft brews for both humans and dogs a-like. The event will take place at Viti’s downtown location at 900 Seymour Street, Vancouver on Sunday, Sept. 22nd from 1 to 4 pm. The back story behind this unique product of doggy beer? Well, the owners of Moon Under Water Brewery - who are passionate about both their craft beer and dogs - decided one day to create a special brew for their own pet who longingly looked up at them whenever they were enjoying a good beer. The resulting ‘doggy beer’ – and yes, don’t worry, it is non-alcoholic – was thoroughly enjoyed and quickly lapped up by their furry pal. With positive feedback by their own pet and some of his other furry friends, they decided to produce a small batch for other dog owners in their local area, and the rest is history. As soon as they caught wind of this rare ‘doggy beer’, Viti - being a pet friendly store - wanted to share this one-of-a-kind product with our dog loving regulars in Vancouver. 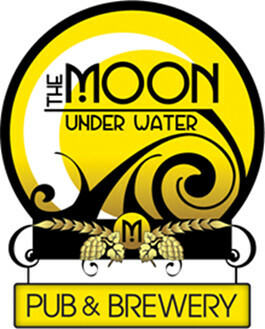 This exclusive tasting event is free and there will be complimentary samples of Moon Under Water beer for both owners and their dogs to experience. And, as per usual, Viti will also be offering doggy treats to all dogs who frequent the store. About Viti Wine & Lager Liquor Store: Located at 900 Seymour in downtown Vancouver, Viti Wine & Lager Liquor Store is the one of the best destinations for specialty wines, hand-crafted local and import beer, and sought-after scotch in Vancouver. With friendly, knowledgeable staff to offer assistance, and superb range of in-store features and specials each month, Viti truly offers something for every taste, and satisfaction is guaranteed. VITI – Interesting Products for Interesting People. The Pressé Summer Series will feature guest DJ’s, complimentary appetizers from 4:00 to 6:00 pm, and drink specials, including a featured pressé for $6.00 and a Grey Goose cocktails roster for $10.00 each. The evenings run from 4:00 through 8:00 pm with the final night of the series on September 13, 2013. Fresh-pressed and inspired by a favourite French café drink, the pressé is traditionally crafted tableside at sidewalk cafés in France. A simple but balanced blend of vodka, fresh-pressed fruit, sugar and club soda, the pressé is the perfect way to celebrate summer and all its bounty. The Pressé Summer Series will kick off on the patio with a guest DJ Charles Blair DJ spinning some hot summer beats, signature menu items from the MARKET by Jean-Georges lounge menu, Grey Goose cocktails, and the Citrus Cherry Pressé as the feature pressé. Guests can expect to be welcomed with local, seasonal, fresh menu items with a global influence that Jean-Georges is known for including the Rice Cracker Crusted Tuna, Citrus with Sriracha Emulsion and the Steelhead Sashimi on a bed of Crispy Rice. The outdoor terrace at MARKET by Jean-Georges, open spring through fall, is one of Vancouver’s favourite hot spots. Overlooking the city below, the terrace provides glimpses of an adjacent ‘green’ roof done with blue and coral flowering plants and black grasses, as well as an art galleria curated by the Vancouver Art Gallery. Ideal for an afternoon cocktail or evening drink, the terrace is a perfect complement to the contemporary MARKET bar and lounge. At MARKET by Jean-Georges, the culinary team presents Jean-Georges’ culinary vision within a chic bar, casual café, seasonal outdoor terrace and refined dining room. MARKET’s menu represents the ‘best of the best,’ a collection of Jean-Georges’ most popular dishes, customized to highlight the richness of British Columbia’s local products, especially the seafood of the Pacific waters. Hamilton Street Grill celebrates another year gone by with a great deal for you! Everyone loves a party and we have decided to have one all month long. are waiting to grill up a steak for you ( or two ). returns to do an amazing cocktail tasting called Whiskies of North America. but the star of the show will be Ryan and the fantastic cocktail he creates for you. This is a perfect way to finish off your work day as it transitions into a great evening. Call 604-331-1511 to make reservations or do it from your mobile device!! Click into www.hamiltonstreetgrill.com and check out new mobile site. Calling all card sharks, gamblers, and beer aficionados. On June 6, 7pm – 2am, The Portside Pub will be transformed into a bona fide riverboat casino for Vancouver’s Craft Beer Week. The evening will consist of a 10-keg “cask off” where brewers will showcase their one-of-a-kind crafted beers specifically brewed for this event with everyone “going all in” to compete for the title of “Cask Maverick”. Decked out in riverboat paraphernalia, there will be casino games with professional dealers, servers in true saloon style costume, and the swing band “Sweetpea Quintet” keeping the dance floor hopping. Casino games include some of the old casino floor favourites like blackjack, poker, craps and roulette – no tapping out allowed. So dust off that brocade vest and white dickey, don a velvet smoking jacket and make like Maverick to The Portside Pub. One of the most exciting seasonal ingredients to grace the beautiful city of Vancouver is the B.C. spot prawn. They are here for a good time, not along time arriving in May and usually not available past the first or second week of June. In honour of this local delicacy, chefs Robert Belcham and Ted Anderson bring their annual B.C. 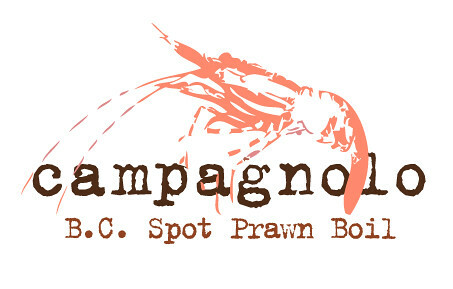 spot prawn boil to the Campagnolo Supper Club. In their 6th year of preparing this highly anticipated boil for Vancouver diners, they will host the event every Wednesday in May, starting May 8 in the upstairs private dining-room at Campagnolo. Guests will spread out along communal tables and share in a massive boil of B.C. spot prawns, Sawmill Bay clams, house-made chorizo sausage and seasonal vegetables. This is a roll-up-your-sleeves and dig-in kind of affair. R&B Brewing Co. is making a cask conditioned beer for each dinner, and beer is included in the price of a ticket. In addition, guests are encouraged to bring their own wine selections with no corkage fee attached, or they can choose from the incredible reserve list of rieslings available at Campagnolo for an additional cost. (Vancouver, BC) Beer and pizza – it’s become a classic Canadian combination. Whether it’s an after game celebration, before class quick bite, or dinner out with friends; beer and pizza is everyone’s ‘go to’ casual meal. It’s become so ubiquitous that most of us take it for granted. Not at Nicli Antica Pizzeria where they continue the century old tradition of creating Neapolitan-style pizzas the proper way – with love, by hand, using the only the best seasonal ingredients. The dinners start at 8:30 p.m. and each includes courses of four different pizzas plus dessert paired with beer from the featured brewery. A representative of the brewery will be in attendance to talk about the pairings and the beers. The very reasonable price of $45 per person, per dinner includes the meal, the pairings, tax and gratuity. Tickets must be purchased in advance and can be obtained on Event Brite. 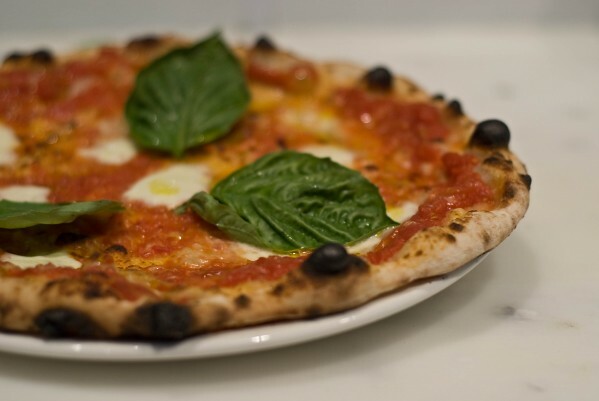 Multi-award winning Nicli Antica Pizzeria is the first VPN (Associazione Vera Pizza Napoletana) certified Neopolitan pizzeria in Vancouver. So far this year it has won Gold, ‘Best Pizzeria’ at the Vancouver Magazine Restaurant Awards, ‘Best Wine List’ at Vancouver International Wine Festival, ‘Best Pizza’ from the WestEnder’s Best of the City and ‘Best Pizza’ from the Georgia Straight’s Gold Plates. Vancouver, B.C. – Vancouver Aquarium’s 7th Annual Night at the Aquarium, presented by PCL Constructors, is set to make waves with Vancouver’s finest on June 13, 2013. The gala fundraiser celebrates and supports the Aquarium’s conservation, research and education efforts. Join host CTV’s Mike Killeen, along with Vancouver’s finest chefs and restaurants serving exquisite Ocean Wise inspired creations paired with international wines. Bid on incredible live- and silent-auction items, from a sturgeon fishing trip with Rick Hansen to a unique sleep over with the Aquarium’s beautiful beluga whales. The 2012 gala raised over $300,000 to support the Vancouver Aquarium’s conservation, research and education initiatives and programs. The goal for 2013 is to continue to raise these much needed funds to support and grow these important programs. VIP reception starts at 6 p.m.
Stanley Park, Avison Way, Vancouver, B.C. There will be an all-Canadian star lineup on the Food Network Celebrity Stage at this year's EAT! Vancouver Food + Cooking Festival: Spice Goddess Bal Arneson, Anna Olson of Bake with Anna Olson, Chef Chuck Hughes of Chuck's Week Off, and Vancouver's own Iron Chef: America winner and Food Concept Architect for Cactus Club Restaurants, Chef Rob Feenie. For the first time, EAT! Vancouver will be highlighting exhibitors offering gluten-free products and seminars. FLAVOURS Magazine is the new presenting sponsor of the show. For the latest news release, click here. *Grapes & Hops Stage, featuring wine and beer related seminars, food pairings, and tastings. *The Bites of Vancouver Pavilion, offering appetizer-size plates from local restaurants. MISSISSAUGA, ON — March 18, 2013 — Following the success of their Fall 2012 limited-time offer Ghost Pepper Burrito, Mucho Burrito, the fastest-growing Mexican restaurant chain in Canada, today announced the launch of three new tacos. Inspired by authentic Mexican street tacos, La Taqueria Trio combines gourmet ingredients with traditional Mexican flavours to create a fusion between fine and casual dining. The La Taqueria Trio limited-time offer is available today until May 3, 2013 at Mucho Burrito locations across North America. “Gourmet food trucks are a growing trend in North America, but you don't see very many Mexican food trucks here in Canada," said Alex Rechichi, CEO and president of Much Burrito. “Our Taqueria Trio limited-time offer adds a gourmet spin on a Mexican favourite, the taco, offering guests a level of quality and flavours they would expect from a fine dining restaurant in a fast food environment." Fiery Chicken Chorizo Fiesta: Grilled chicken, chorizo crumble, coleslaw, habanero fig spread, guacamole and sour cream. Guacagrilled Pineapple Carnitas: Slow roasted pork, adobo mole sauce, grilled pineapple, red cabbage, guacamole and onion chips. Mango Steak Tango: Grilled steak, green mango slaw, spicy aioli drizzle. Mucho Burrito will be hosting a Facebook contest for the duration of the campaign. Prizes include gift cards and the grand prize of free burritos for a year. Guests are also encouraged to follow @MuchoBurritoHQ on Twitter for chances to win gift cards and other prizes during the promotion. Mucho Burrito, part of the Extreme Brandz family of quick service restaurants, is dedicated to crafting the freshest and most flavourful quality Mexican food designed to stimulate guests’ senses. Co-founded by brothers Alex and Mark Rechichi, the first location was opened in Mississauga, Ontario in 2006. Today, there are more than 63 locations across North America. For more information, visit www.muchoburrito.com. Extreme Brandz is a leading Canadian quick service restaurant franchisor of Extreme Pita, Purblendz and Mucho Burrito. Based in Mississauga, Ontario, Canada, the company was created by brothers Alex and Mark Rechichi in 1997 with the opening of an Extreme Pita location in Waterloo, Canada. In addition to ranking in Entrepreneur magazine's list of top restaurant franchises in 2011, Extreme Brandz won the 2011 Company of the Year Pinnacle Award. Today there more than 350 locations of the three brands across North America. For more information, visit www.extremebrandz.com. Presented by Vancouver Aquarium and Naramata Bench Wineries Association. Be the first to experience new spring release wines from the Naramata Bench - while supporting the conservation of our oceans. On April 26, join us for a delightfully delicious evening as we uncork Naramata Bench’s first and finest spring release wines. Sample tasty Ocean Wise culinary offerings, meet the Naramata Bench winemakers and owners, and bid on silent auction items of fine wines from Naramata Bench and exclusive prize packages. It’s like a pre-season visit to Naramata Bench for one magical evening! Tickets are in great demand, so purchase your tickets early to avoid disappointment. When: Friday, April 26, 2013, at 7 p.m.
For more information on Wine for Waves, please visit vanaqua.org/wineforwaves. For more information on Ocean Wise, please visit oceanwise.ca. VANCOUVER, BRITISH COLUMBIA, JANUARY 23, 2013 – On January 28, 2013, Gastown will see the launch of its newest pub and music venue. The historic, three-level, Portside Pub located at 7 Alexander Street has been built with the traditional east coast pub culture as its inspiration. The result: a comfortable and affordable place for people to gather and enjoy good music and a great pint. 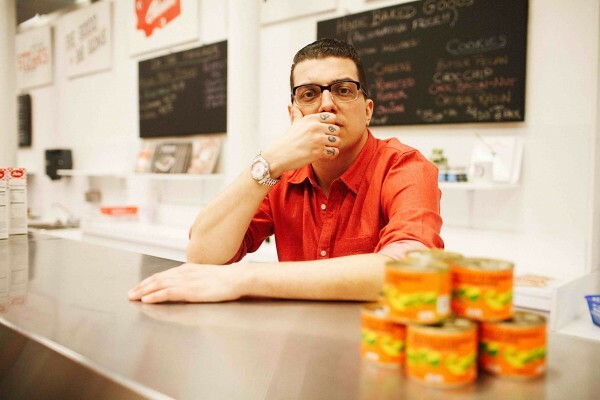 Portside is the latest undertaking by entrepreneur Mark Brand, owner of Save On Meats. In renovating the old Post Modern space, Brand set out to celebrate the beauty of the original historic Gastown building. Sandblasted walls and old exposed brick and timbers are juxtaposed with some of the latest technology in beer drinking. One of only a few medium sized venues in the city, Brand hopes it will be a new hub for the local music scene. Originally from the east coast, Brand grew up with a strong pub culture which he feels is lacking in Vancouver. By bringing in long-time friend and colleague Andrew Flynn as general manager, he hopes to change the scene. A Newfoundlander, with a 15-year background in bartending from Killarney, Ireland, Flynn knows what real pub culture is all about. “Pubs are a connecting place for people within a community. Our vision is to make Portside the friendliest pub in Vancouver, where anyone and everyone feels at home. Simply put, Portside will be all about craft beer, local music, and great atmosphere,” says owner Mark Brand. Overseeing the pub’s beer program will be the Portside’s very own Cicerone, or beer sommelier, Aja Tylor. Tylor will be managing the pub’s 24 craft beers, which will pump through 48 taps split over three levels. 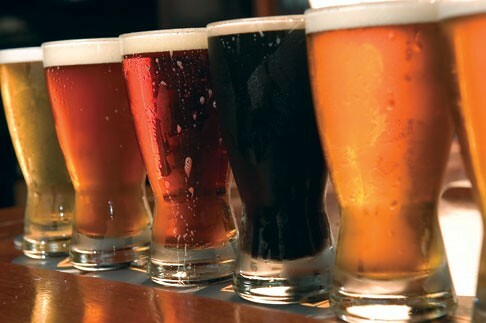 The beers will range from locally sourced favourites including the lager and IPA from Victoria based Phillips Brewery, as well as international brews like the Belgium Palm Amber Ale, Erdinger Weissbier Dunkel, and Delirium Tremens. Vancouver BC, January 8, 2012 - Campagnolo ROMA celebrates Roman cuisine by honouring the principles of slow food, seasonal ingredients and rustic cooking. On a few dates each year, Chefs Ted Anderson and Nathan Lowey pay homage to the renowned Roman cuisine created from offal known as Quinto Quarto. 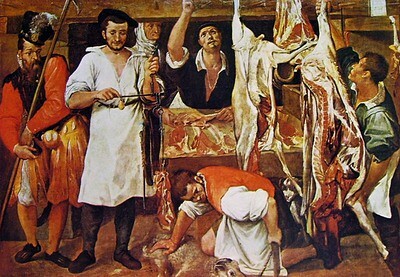 This cuisine reflects the ancient city of Rome's rich history of cooking offal meats originated by the butchers of the Testaccio district. 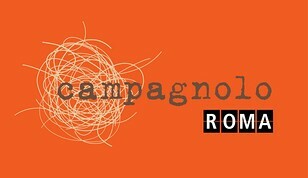 Guests are invited to join the team at Campagnolo ROMA in keeping this important Roman tradition alive and experience Quinto Quarto on January 23, 2013 at 8:30pm. This unique dining experience features a variety of dishes showcasing offal, served alla famiglia at communal tables. Tickets are $59.50 and are available for purchase online at quintoquartojan23.eventbrite.com. VANCOUVER, British Columbia – Every January for 19 years, Liberty Merchant Company hosts a fundraising event to start the bar high for the new year. Liberty is once again recruiting British Columbia’s finest food and beverage purveyors for Taste BC: a fundraiser for the Oak Tree Clinic at BC Children’s Hospital. BC Children's Hospital's Oak Tree Clinic provides specialized HIV care for infected women, pregnant women, partners, children and youth, and support services for affected families. Thanks to the generosity of companies like yourselves, the event has raised a collective total of $203,179 since 1995 to benefit the Oak Tree Clinic. The 19th annual celebration of local food and drink takes place January 15, 2013 (4:30-7:30 p.m.) at the Pan Pacific Hotel in downtown Vancouver. Guests will taste, sip and experience BC’s finest wine, beer and spirits accompanied by tasty fare from our best local restaurants. Along with excellent food and drink, attractions include live music, door prizes, and a silent auction that rivals any other. Silent auction items include luxury items, local experience packages, destination packages and delicious products made by British Columbia’s own. Taste BC is an event that is not to be missed. Help support the Oak Tree Clinic while enjoying the finest B.C. has to offer. Tickets are $49.99 and available at Liberty Wine Merchant stores. 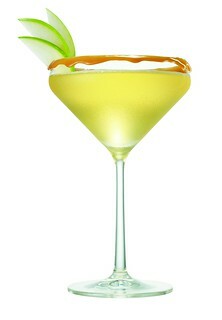 For the most up-to-date information, please visit www.taste-bc.com and follow us on Twitter and Facebook. Taste BC sponsored by 102.7 the Peak, CTV, Edible Vancouver, Metro News, The Pan Pacific Vancouver Hotel and Precision Graphics. About Liberty Merchant Company Inc. Established in 1986, Liberty Specialty Imports Inc. is the parent company of Liberty Wine Merchants, the largest chain of private wine stores in Western Canada. Liberty imports more than 400 exclusive and affordable wines and spirits, all hand-selected from over 120 of the world's top wine producers. Liberty Wine Merchants carries 5,000 wines through six locations in Metro Vancouver, along with its original location in Point Roberts, WA. For additional information on Liberty Merchant Company, please visit www.libertymerchantcompany.com. For media or image requests relating to this or other events please contact Alexander Wilde at (604) 739-7801 or e-mail marketing@libertywinemerchants.com. VANCOUVER, BRITISH COLUMBIA, November 28, 2012 – In one of the season’s most moving episodes, Arlene Dickinson offered her full support to Vancouver’s Save On Meats last night on CBC’s “The Big Decision.” After working with the team and learning about the critical work they do to support those in need, Arlene was more than happy to come on board. Entrepreneurial icon Arlene Dickinson visited Save On Meats in Vancouver’s Downtown Eastside to see if she could help owner, Mark Brand, trim the fat off the business and increase community support. To help gauge their level of commitment, the team was given a series of challenges to try and increase their revenue. Working hard to prove themselves, Save On Meats rose to the challenges and more than exceeded Arlene’s high expectations. Save On Meats houses a butcher shop, sandwich counter, diner and much more. Brand and his team are working to build a true social enterprise by collaborating with community partners and programs to create a sustainable business model serving the Downtown Eastside. Save On Meats employs over 65 workers, many of which live in the community and with some struggling with employment barriers. With strong ties in community initiatives including a meal program for 450 plus people per day, seven days a week, Save On Meats is an anchor in the renewal of Hastings Street. Save On Meats has been a Vancouver landmark since in opened in 1957. Mark Brand resurrected the enterprise in 2011 with a vision to restore the building back to its prime for the local East Vancouver community and Vancouver residents. Today, Save On Meats houses a butcher shop, sandwich counter, diner and much more. Working with local partners, Save On Meats is a leader in the charge to make the social business model independently sustainable. Vancouver, BC – November, 26, 2012: After much anticipation, the first Your Independent Grocer store location has arrived in Vancouver. Davie St.’s Your Independent Grocer® location will finally open its doors to the downtown Vancouver neighbourhood on Friday December 7th. The 18,000 square foot store, open daily from 7:00 a.m. – 3:00 a.m. is located at 1255 Davie St. and will provide customers with a shopping experience that focuses on fresh food, low prices and shopping convenience. With 23 years of grocery experience, store manager Lyle Miller is passionate about great customer service and fresh food. He is excited to bring the first Your Independent Grocer® store to the downtown Vancouver community. The event will celebrate the opening of many departments and offerings to customers, including an assortment of artisan breads and custom cakes in the bakery department, deli service counters providing a wide range of quality delicatessen meats and cheese from around the world, and an assortment of quality and good value products. Along with the ribbon-cutting, the ceremony will include cake and refreshments for customers, free food sampling throughout the store, and free giveaways to the first 500 customers. Also look for a Your Independent Grocer® truck in the downtown Vancouver area prior to the grand opening that will be handing out hot chocolate, and branded take away items to the community. Convenience…a fast & easy shop! Davie St.’s Your Independent Grocer® store is clean and uncluttered with easy to navigate aisles, extended store hours, multiple checkouts and accessible parking all to make shopping a pleasant experience! Value…just what shoppers need! Davie St.’s Your Independent Grocer® store strives to offer items on the everyday shopping list at great value including an array of President’s Choice® and no name® products. Meals to GoTM –Market style Meals To GoTM section featuring a great selection of items prepared fresh daily. Choices include hot entrees, salads, sushi, and sandwiches. Produce – A fresh produce department to provide a larger variety of delicious fresh fruits and vegetables, including organics. Deli Meat & Cheese – Providing a wide range of top quality delicatessen meats and cheeses from around the world. PC® points, redeemable for groceries and other great rewards, by using PC Financial® MasterCard® or the no fee daily banking PC Financial® debit card. WHAT: Grand opening of Davie St.’s Your Independent Grocer® location, with a ribbon cutting ceremony, and cake and refreshments for customers, free food sampling, and free giveaways to first 500 customers. WHEN: Friday December 7th 9:00 a.m.
STORE HOURS: Open daily from 7 a.m. – 3 a.m.
Vancouver, British Columbia (November 22, 2012): The only thing better than giving everyone on your list something unique and artisan-made is if it's free! 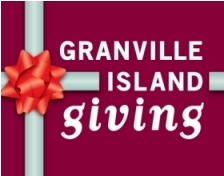 From now through December 23, 2012, click with Granville Island online for a chance to win a $500 shopping spree courtesy of the Island. Simply visit granvilleisland.com/giving to enter*. Making it even easier for shoppers to navigate the season of gifting, Granville Island is rolling out a fresh crop of videos highlighting artisans in the Railspur District and Net Loft. Led by local media personality Erin Shaw, the videos were shot at popular Island locales including Artisan Sake Maker, Beadworks, The Granville Island Broom Company and New-Small Sterling Studio Glass. Spur gift-getting and giving inspiration while gleaning behind-the-scenes details from the passionate vendors. From brooms to bracelets, glass owls to sake, learn more about each shop’s unique offering in the short videos, posted to Granville Island’s Facebook page: facebook.com/granvilleisland. Granville Island is a treasure trove for those seeking that ‘special something.’ Whether it’s local fashions, handmade house wares, or one-of-a-kind artwork, source items at every price point from more than fifty artists and artisans located in the Net Loft, Railspur District, and throughout the Island. *$500 shopping spree must be spent in one visit to Granville Island. Prize must be redeemed by February 28, 2013. Granville Island Public Market and The Net Loft are open until 7 pm, seven days a week. For more information about merchants and other special events, visit granvilleisland.com. Follow us on Twitter @Granville_Isle. Vancouver, BC – November 19, 2012 – While hunger is a year round reality for many families, the holidays can bring added pressure to ensure cupboards are not bare. British Columbia food banks assist an average of 96,150 individuals each month, 29.5 per cent of whom are children. To respond to this need, Real Canadian Superstore®, Your Independent Grocer®, No Frills®, Extra Foods®, and Wholesale Club™ are holding the Extra Helping™ Holiday Food Drive from November 23 to December 13, and are encouraging local residents to help by donating food or funds. To help, simply purchase or bring nutritious, non-perishable food items and drop them into the in-store Extra Helping™ donation bins, or make a cash donation at check-out. To help customers quickly and easily identify the food bank’s most needed items while they shop, Real Canadian Superstore®, Your Independent Grocer®, No Frills®, Extra Foods®, and Wholesale Club™ stores will have the Extra Helping™ logo featured on shelves in a variety of aisles. In 2012, with the generosity and support of their customers, Loblaw grocery stores like Real Canadian Superstore® and Extra Foods® have raised $627,000 in funds and 647,000 pounds of food for food banks across Canada and are hoping to raise a grand total of $1.2 million and 1.2 million pounds of food by year end. To make it even easier for customers to donate, participating Loblaw banner stores like Real Canadian Superstore®, Your Independent Grocer®, Extra Foods®, and Wholesale Club™ will sell a specially designed $5 PC® Blue Menu® Deluxe Cheddar Macaroni and Cheese Dinner. When customers purchase the $5 box, they are donating 4 food items, and a $1 cash donation. Customers can donate knowing that their $5 will purchase healthy food items for Canadian families in need. All they need to do is pick up the box while grocery shopping, pay for it when they check out and drop it in the Extra Helping™ donation bin on their way out. Since 2008, Loblaw Companies Limited has made an annual corporate donation to Food Banks Canada to support their National Food Sharing Program. To date, donations total $1.125 million, including a $250,000 donation in 2012. And, while Loblaw grocery stores have always supported local food banks, since the launch of the twice annual approach of the Extra Helping™ Food Drive campaign, Loblaw grocery stores have raised over $4.2 million and over 4.6 million pounds of food to support local food banks between 2009 and year to date. In British Columbia, the most needed, non-perishable items include: canned proteins such as fish & meat, meals in a tin like hearty stews, dry whole wheat pasta, rice, canned fruit & vegetables, meals in a box, macaroni & cheese, whole grain cereal, granola bars, baby food & formula, according to Food Banks BC. Food Banks BC is the provincial association of 93 member food banks across the province! Our vision is a hunger-free future, and we work hard to support and inspire each one of our member food banks so that they can in turn, achieve hunger-free communities all over BC. Every year through the National Food Sharing System (NFSS), we distribute more than one million pounds of food to community food banks. Plus, through our BC Sharing coupons program, food banks in our province are able to work directly with their local grocery stores to receive food donations, every time a shopper scans a BC Share coupon. Last year, our food banks helped close to 100,000 people throughout the province…. 30% were children! Loblaw Companies Limited, a subsidiary of George Weston Limited, is Canada's largest food retailer and a leading provider of drugstore, general merchandise and financial products and services. Loblaw is one of the largest private sector employers in Canada. With more than 1,000 corporate and franchised stores from coast to coast, Loblaw and its franchisees employ more than 135,000 full-time and part-time employees. Through its portfolio of store formats, Loblaw is committed to providing Canadians with a wide, growing and successful range of products and services to meet the everyday household demands of Canadian consumers. Loblaw is known for the quality, innovation and value of its food offering. It offers Canada's strongest control (private) label program, including the unique President's Choice®, no name® and Joe Fresh® brands. In addition, the Company makes available to consumers President's Choice Financial® services and offers the PC® points loyalty program. On Dasher, on Dancer, on Prancer, on Vixen! CocoaNymph’s chocolatiere Rachel Sawatzky has whipped up a new batch of holiday truffles that Santa’s reindeer can’t wait to deliver! 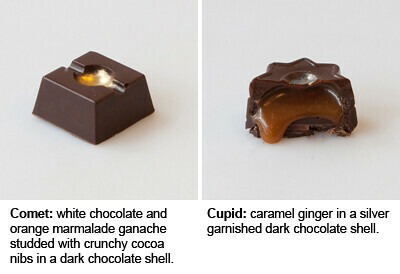 "I am totally passionate about the caramels this season," says Rachel. "Cupid, the ginger caramel, and Donner, the coffee flavoured caramel, are my favourites from the collection. 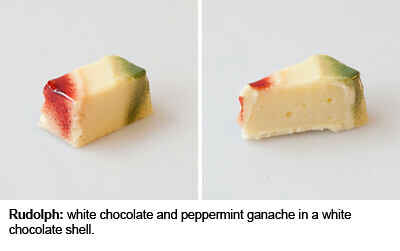 These are brand new flavour profiles for CocoaNymph, so it's very exciting!" The holiday truffles are $1.95 each and $16 for the complete 9-piece box set. Don’t miss out on these holiday delights! 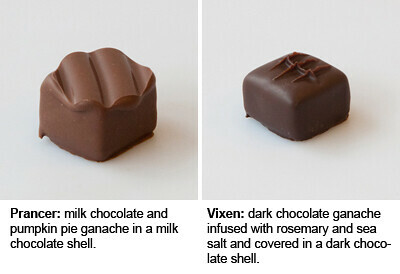 Pick them up in Vancouver at CocoaNymph East (4 West 7th Avenue) or CocoaNymph West (3739 West 10th Avenue). On Saturday, November 24th we are celebrating the first anniversary of our New Westminster location at The River Market. From 5:30 to 8 p.m. we'll be offering our regular dinner menu PLUS a special five-course tasting menu for only $25. Starting at 9 p.m. we're throwing a party with a Chinese Night Market vibe - $5 drink specials, small bites, and raffle door prizes. Live music provided by Les is More. There's no admission or cover charge - however, a suggested $5 donation to the New Westminster Food Bank will guarantee you a free drink token. Depending on how many advance bookings we receive, there may be some first-come, first-serve admissions at the door, but why take the chance? 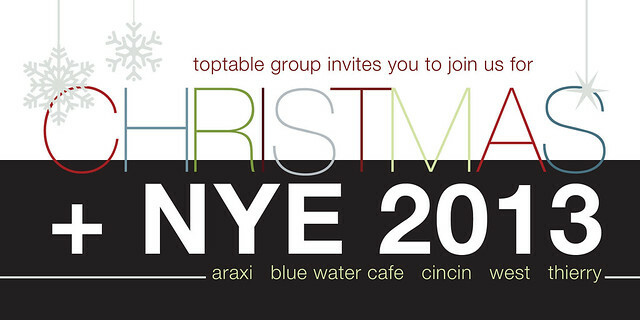 Celebrate the Holidays with Toptable this season! From traditional dinners on Christmas Day, to glamorous New Year’s Eve celebrations, we have your holiday entertainment needs covered. Chef Quang Dang is pleased to present an exciting month of Holiday dining throughout December. Whether you are planning a Christmas business lunch, or a celebratory dinner with family, the team at West will ensure a most festive experience! Celebrate New Year’s Eve at West with Chef Quang Dang’s specially crafted tasting menu. We suggest starting off with David Wolowidnyk's award-winning cocktails, and toasting 2013 with a crisp glass of bubbly! Ring in the New Year at CinCin with a special evening featuring a celebratory menu by Chef Andrew Richardson. With an award-winning wine list, craft cocktails and live music by Matthew Smith and his band, you can countdown to 2013 in style! Celebrating New Year’s Eve in Whistler? Araxi is your destination for a memorable night of spectacular food and wine, with music from Vancouver's DJ Steamboat Fattie - and a lively countdown to usher in a new year! Whether you want an early seating before a night on the town or a full gala celebration, we can guarantee a very special evening. Spend this New Year’s Eve surrounded by friends and feasting on Chef Frank Pabst’ selection of Vancouver’s best seafood. Greeted with bubbly on arrival and the sounds of renowned "DJ Ocean" – this celebration is not to be missed! For yourself or as a gift, the Toptable Group Gift Card is a great opportunity to experience the diversity of our five award-winning venues. Concord Pacific presents CandyTown – A Yaletown Holiday Festival. Come to Mainland and Helmcken on Saturday, November 24, 2012 between 1pm and 5pm to visit Rudolph the red-nosed reindeer at the North Pole! and of course, the North Pole itself! Bring your cameras and snap photos with Santa and the reindeer. Donations to the BC Children’s Hospital Foundation are greatly appreciated. Reindeer in Yaletown is a part of CandyTown. Read more about CandyTown here. 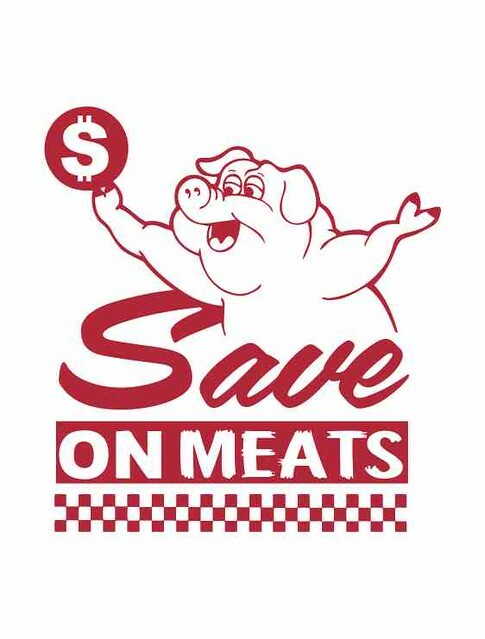 Save on Meats has been a Vancouver landmark since it opened in 1957 serving the local community with a butcher shop and lunch counter. After closing down, Mark Brand resurrected the Save On Meats enterprise carrying with him a vision to restore the building back to its prime for all Vancouver residents.Today, Save on Meats houses a butcher shop, sandwich counter, diner and much more. Brand and his team are working to produce a true social enterprise by collaborating with community partners and programs to create a sustainable business model serving the Downtown Eastside. Save on Meats employs over 65 workers, many of which live in the community and with some struggling with employment barriers. With strong ties to community initiatives including a meal program for 450+ people per day seven days a week, Save On Meats is a strong anchor in the renewal of Hastings Street. Save on Meats is appearing on CBC's "The Big Decision" on the evening of November 27 at 9:00 pm. Each episode focuses on two Canadian businesses that are struggling to survive in today’s volatile economy. One of Canada’s most-renowned marketing communications entrepreneurs, Arlene Dickinson, will decide whether she will step in and invest with Save on Meats. Facing mounting debts and a need for renovations, Brand is in need of her help. The stakes are high - will Arlene decide to come to his financial aid and help this neighbourhood icon? Chef in the Kitchen - Save on Meats Cooking Classes launching in December - join the chefs in the kitchen at Save on Meats for a series of cooking classes designed to ignite your inner chef. From butchering to sausage making, learn a new skill and take home something home for you to enjoy. (Vancouver, BC) – ‘Deck the halls with boughs of holly…’ sings the ancient Christmas carol. However, at VanDusen Botanical Garden, in a reversal of the old song’s lyrics, a dedicated team of gardeners and volunteers have been working flat out to deck the Garden’s boughs (trees, shrubs) and buildings with strings of ‘jolly’ light bulbs in preparation for the Garden’s Festival of Lights. Festival of Lights has become a must-do seasonal tradition for people of all ages and backgrounds – from families to dating couples, from grandparents to toddlers. Once inside the gate, guests don’t want to leave as they find them selves amidst a magical wonderland of twinkling lights, joyful music and the glowing smiles of happy people. “Everyone is jolly, not just Santa,” says long-time volunteer Lynne Irwin. This year’s Festival of Lights runs every night from December 7, 2012 through January 1, 2013; 4:30 – 9 p.m., except December 25th when the Garden is closed. Kids will love to meet Santa Claus in his Living Room (Dec.7-24) and don’t be surprised if you are accosted by our genial (and very jolly) Scandinavian Christmas Gnomes - Svend and Jens who have been stealing hearts and inspiring gleeful laughter since their arrival at Festival of Lights six years ago. You’ll find them wandering about the Centre Court , Entrance Plaza and at their Gnome Home A highlight every year is the ethereal Make-A-Wish Candle Grotto. New this year is Make-A-Wish’s Room of Joy. Located in the Visitor Centre’s Discovery Room, the Room of Joy will feature a magical Winter Wonderland display created by the Vancouver Lego Club. From Dec.7th – 21st, you’ll be serenaded by our popular Community Choir Concerts from their location on the Entrance Plaza overlooking Livingstone Lake. Other highlights include the enchanting Gingerbread Wood, the fun and interactive Sparkle Spruce, and Lovers' Lookout. Come hungry as there’s plenty to eat: Dr. Waffle will be serving up savoury and sweet waffles in the Perennial Garden (near the Make-A-Wish Candle Grotto). Shaughnessy Restaurant, in addition to their full-service restaurant, will be operating two snack bars - one on the covered deck adjacent to Santa’s Living Room and the other next to the Gnome Home. Truffles Café, will be operating three outdoor kiosks (a hot chocolate stand and a soup bar on the Entrance Plaza plus a BBQ Hut by Gingerbread Wood) in addition to offering hot drinks and warm snacks at the entrance to the Visitor Centre for those waiting to buy tickets. Of course Truffles Café inside the Visitor Centre will also be open for more substantial fare. Advance tickets are on sale now at Tickets Tonight at 604-684-2787 / www.ticketstonight.ca (service charge applies) or you can pick them up in person at the Garden’s Admission Desk (no service charge) during opening hours. Tickets are also available at the Gate every evening of the show. To avoid the nightly ticket line-up, we strongly advise you to purchase tickets in advance as advance ticket holders walk right in. VanDusen Members also do not have to wait in line. VanDusen Botanical Garden is located at the corner of Oak Street and W.37th Avenue in Vancouver. VanDusen wishes to thank Event Sponsor Western One Rentals & Sales and Media Sponsors, Ming Pao Newspapers (Canada Ltd.) and The Vancouver Courier for their generous support. Vancouver, British Columbia (November 8, 2012): This holiday season give the gift of a deliciously entertaining food tour through Vancouver’s historic Gastown neighbourhood. Taste Vancouver Food Tours’ ‘Christmas Culinary Tour,’ operates December 1 - January 6, and is the ideal gift for food-loving family and friends -- as well as a tasty team building excursion for co-workers. The tour delivers an intimate culinary journey through the food-centric area. Experience the savoury tastes, sounds, and sights of Vancouver’s eateries and shops. Led by an actor guide impersonating historic “Gassy Jack,” the founder of Gastown, the two-hour walking tour stops at nine West Coast eateries, where guests will enjoy an array of food and beverages. Rain, snow or shine, the tour commences with an eggnog latte and pastry, served up by host partner, Starbucks. Next, savour Rogue Wetbar`s Lobster Mac n' Cheese. Thirsty? Steamworks Brew Pub comes to the table with a handcrafted "Blitzen" 9% beer. At Rogers' Chocolates, reward your sweet tooth with melt-in-your mouth "Ice Wine Truffles” made only more satisfying with Maple Delights’ Grand Marnier Hot Chocolate. From sweet to savoury and back again, the rollercoaster of flavour welcomes Brioche’s Italian three cheese tortellini in a rich salsiccia ragu and Chronic Tacos’ delicious spin on the California classic, Fish Tacos served with house-made tortilla chips and salsa. Food gluttony is cured with a stop at Trees Organic for creamy Cheesecake, voted best in Vancouver. And just like that, it’s time for tea. The tour wraps up with a stroll into Blood Alley at the back of Gaoler’s Mews to the Gastown Tea House where a hot cup of Christmas aromatic Market Spice Tea awaits. This holiday season think outside the traditional ribbon-tied box and gift-wrap a culinary experience. No assembly required, except outside Pan Pacific Starbucks. Instructions are as follows: bring a camera, sense of adventure and an appetite. The Christmas Culinary Tour operates December 1 - January 6, from 2:00 pm to 4:00 pm Price: $39 per person (includes nine food and beverage bites and sips) Tours can accommodate up to 16 guests. To book your Christmas party or check that special someone off your shopping list, please visit tastevancouverfoodtours.com. A few months ago, you may have seen a video that was developed by Vancouver Aquarium’s Ocean Wise program, a national sustainable seafood initiative, to help raise awareness of the importance of making smart, healthy choices for our oceans. Since November is Ocean Wise month, a second video was developed! Check it out below. The Okanagan Valley has gained an international reputation for the quality of its wines. The wines of the South Okanagan are considered in a class by themselves with their unique terroir, hot summers and general drier climate than the North Valley. Join us on November 29th for a very special dinner with Pascal Madevon, wine maker for Osoyoos Larose, one of the region’s premier wineries. Executive Chef Tobias Grignon has designed an elegant menu to showcase these exceptional wines and will be demonstrating some of his techniques in making the dishes. Price for the evening is only $110 per person and includes: five-course dinner, full wine pairing, taxes, gratuities along with presentations by Chef Tobias and Mr. Madevon. Book quickly at this event is sure to sell out 604-731-5020. VANCOUVER, British Columbia – Liberty Merchant Company proudly presents its annual Fall into the Market tasting event. This Liberty-sponsored event is in support of the BC SPCA, to protect and enhance the quality of life for domestic, farm and wild animals in British Columbia. All proceeds from both ticket sales and draw prizes directly support the BC SPCA. The evening will feature coastal wines along with tasty samplings from Granville Island food purveyors. It’s the perfect autumn event! Join us on Wednesday, November 7th, from 7:30 - 9:30pm at the Net Loft on Granville Island. Tickets are $24.99 and available at all Liberty Wine Merchants locations. For more information on this and future events, please visit http://www.libertywinemerchants.com. Established in 1986, Liberty Merchant Co. is the parent company of Liberty Wine Merchants, the largest chain of private wine stores in Western Canada. Liberty imports more than 400 exclusive and affordable wines and spirits, all hand-selected from over 120 of the world's top wine producers. Liberty Wine Merchants carries 5,000 wines through five locations in Metro Vancouver, along with its original location in Point Roberts, WA. For additional information on Liberty Merchant Company, please visit http://www.libertymerchantcompany.com. “Provence’s Wine Bar is meant to be very casual and value-priced,” says Chef Quaglia. “We are introducing a wine-friendly Bites Menu created especially for The Wine Bar.” ‘Bites’ come in two sizes - Small Bites created to accompany a glass of wine, and for more substantial appetites, Big Bites that can be shared. Wines by the glass will start at $7 with Small Bites coming in at $5 per dish and Big Bites priced at $18. NEW YORK - September 24, 2012 - A roster of acclaimed chefs return for a second chance to become a member of the Iron Chef culinary society this fall, with the premiere of The Next Iron Chef: Redemption on Sunday, November 4th at 9pm ET/PT. The fifth installment of this top-rated competition series also adds a few newcomers to the mix, who have had their own experiences of not quite winning the crown. The competitors are given new opportunities to prove their skills are Iron Chef worthy, while revisiting some of the memorable moments that sent them home in the past. The culinary battle-royale, hosted by Alton Brown and shot in Los Angeles and Las Vegas, tests the kitchen chops, masterful skills and fortitude of these supreme experts, and culminates with the naming of the newest Iron Chef on Sunday, December 23rd at 9pm ET/PT. Competitors are: returning from The Next Iron Chef: Season Two Nate Appleman, Amanda Freitag (Chopped), Eric Greenspan (The Foundry on Melrose, The Roof on Wilshire, Los Angeles) and Jehangir Mehta (Graffiti, New York); from The Next Iron Chef: Super Chefs Elizabeth Falkner (Krescendo, New York), Alex Guarnaschelli (Butter, The Darby, New York, Chopped) and Spike Mendelsohn (Good Stuff Eatery, We The Pizza, Washington D.C.); and first time Next Iron Chef competitors with their own redemption stories, Tim Love (The Lonesome Dove, Western Bistro, The Love Shack, Woodshed Smokehouse, White Elephant Saloon, Fort Worth) and Marcel Vigneron (The Coop, Los Angeles). "This season's cast is filled with extraordinary chefs at the top of their game and they all know how fierce this competition is," said Bob Tuschman, General Manager and Senior Vice President, Food Network. "The redemption theme heightens the season's drama with second chances and new opportunities, and viewers can expect culinary magic, intense battles and edge-of-your seat suspense." Redemption offers a Food Network first, as the tenth cast position will go to the winner of the web-exclusive "Road to Redemption" tournament taking place October 12th - 26th on FoodNetwork.com. Participants battling for their chance at Redemption's tenth slot are Duskie Estes and Robert Trevino, who previously competed on earlier seasons of The Next Iron Chef and newcomers Lee Anne Wong and Madison Cowan. "Our web-exclusive 'Road to Redemption' tournament adds a whole new layer to The Next Iron Chef experience," said Bob Madden, General Manager and Senior Vice President, Digital - Food Network Category, Scripps Networks Interactive. "This online exclusive will give our audience more of the content they crave and the opportunity to witness more excitement and energy from these skilled competitors. FoodNetwork.com is thrilled to play a part in selecting the tenth competitor for this season's cast." Exclusively on FoodNetwork.com, the "Road to Redemption" tournament begins October 12th with a battle between former Next Iron Chef contenders Duskie Estes and Robert Trevino, followed on October 19th by a competition between Iron Chef America challengers Madison Cowan and Lee Anne Wong. The winners meet on October 26th, where the final Redemption position will be awarded. Beginning in late September, a sneak peek and extended preview will be available at www.foodnetwork.com/nic. The Next Iron Chef: Redemption kicks off on "Redemption Beach," where the chefs' resourcefulness is tested in a grueling Chairman's Challenge with a devious twist: each must cook with the ingredient that sent them packing last time. Given another chance with this ingredient and only bare essentials, hot coals and one hour on the clock some rise to the occasion while others go down in flames. The two least successful chefs go to the Secret Ingredient Showdown, a sudden-death cook-off that leads to the first elimination. Upcoming episodes continue to push the limits, including a canned food to Kitchen Stadium-worthy cuisine challenge, a Las Vegas buffet battle with an appearance by legendary magician David Copperfield and a "last supper" showdown. Returning judges Donatella Arpaia and Simon Majumdar are joined by last season's winner and newest Iron Chef Geoffrey Zakarian on the judging panel, along with appearances from Iron Chefs Bobby Flay, Masaharu Morimoto and Michael Symon. The winner will join the ranks of chefs including Bobby Flay, Marc Forgione, Jose Garces, Masaharu Morimoto, Michael Symon and Geoffrey Zakarian as a member of the Chairman's team on Iron Chef America. The newly crowned Iron Chef's first battle in Kitchen Stadium will premiere on Sunday, December 30th at 9pm ET/PT. Viewers who want more can also visit FoodNetwork.com for exclusive photo galleries, behind-the-scenes videos, weekly fan polls, cast journals and more insider coverage. The Next Iron Chef is produced by Triage Enterainment in conjunction with Food Network and is based partially on the format Iron Chef owned by Fuji Television Network Inc.
Vancouver, BC (October 24, 2012): The Fish Shack, The GLOWBAL COLLECTION's new laid-back eatery, opens to the public today at 8 pm. Housed in the former Sanafir location, the soaring 100-seat space has been completely transformed to reflect the casual new offer. BOX Interior Design led the revamp with a nod to the nautical. Marine-blue walls are offset by cool green tiling. Red upholstered banquettes conjure the look of vintage lifejackets. And the chalkboard walls are perfect for sharing fish facts alongside daily features. "We're happy to be part of the sea change that's making Granville Street a draw for food and entertainment," says Emad Yacoub, GLOWBAL COLLECTION Proprietor. "Fish Shack's satisfying, unfussy and fun. We hope people love it." At the helm of kitchen operations is Executive Chef Alfred Contiga, who comes most recently from SOCIETY Dining Lounge. Staying true to the restaurant's name, the menu offers up seafood favourites, such as: Fish & Chips - Halibut, Lingcod, Salmon, Haddock, Snapper, Oyster or Prawns, paired up with crunchy coleslaw in a variety of fresh flavours; Mussels or Clam 'Steamers' simmered in a trio of sauces; Burgers - Kentucky Fried Oyster or Blackened Snapper; Cajun Fish Tacos; Prawn Louie Salad; Fried Whole Trout; and Spag & Prawn Meatballs. Daily Buck-a-Shuck Oysters: From opening until 5 pm. Lobster and Crab Fest Sundays: Enjoy a fresh 1lb lobster or whole crab on special for $19.95 every Sunday. The Fisherman's Catch: A fresh medley of seafood including Dungeness crab, snow crab, mussels, prawns, calamari and crayfish, released from the net right before guests' eyes. Small Catch, $20 per person. Big Catch, $30 per person. Minimum of two people. Weekend Brunch: 10:30 am - 3 pm Saturday and Sunday. Lobster & Eggs, Prawn Frittata, Dungeness Crab Benny and Carrot Cake French Toast are amidst the many tempting dishes. Carnivores need not jump ship. Meaty options like the Prime Rib Burger, Half Roasted Chicken and Spag & Meatballs will surely float their boat. Sunday, 10:30 am - 1 am. About The GLOWBAL COLLECTION The GLOWBAL COLLECTION is comprised of nine restaurants: glowbal grill steaks & satay, COAST Restaurant, Italian Kitchen, Trattoria Italian Kitchen, SOCIETY, Black+Blue, The Fish Shack, two IK2GO locations; and two lounges: AFTERglow and O Lounge. The energy, bustle and allure of these celebrated Vancouver restaurants are what most people notice first. In addition, flawless service, exquisite wine lists, and some of the most inventive, celebrated cuisine in Vancouver define every restaurant in the collection. glowbalgroup.com. 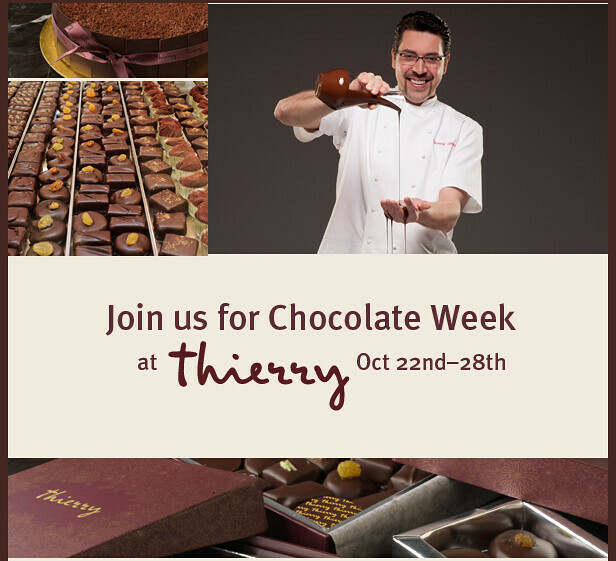 We are delighted to announce the inaugural launch of Chocolate Week at Thierry Chocolaterie Patisserie Café, a special week dedicated to Chef Thierry’s love and passion for all things chocolate. Taking place from Monday, October 22nd – Sunday, October 28th, Chef Thierry will present an exciting menu of events: from new product launches, to exclusive menu additions and chocolate sampling sessions. A percentage of chocolate sales from each day will be donated to St. Paul’s Hospital. We are also thrilled to present an evening of ‘Chocolate + Bubbles’, hosted by Chef Thierry himself! Please join us for a very special evening where guests will be treated to a selection of Chef Thierry’s chocolate creations, paired with his favourite bubbles and red wine. This intimate event offers an opportunity to hear from our maître pâtissier himself about his love of chocolate, its preparation and the fine art of chocolate and wine pairings. 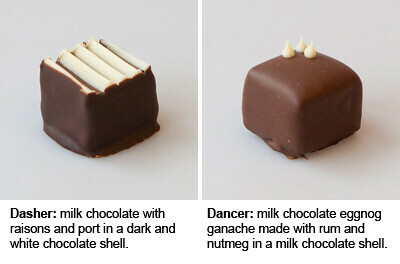 Chef Thierry’s chocolates are founded in the traditions of his native France, where he learned his craft as a young man. He personally selects only the finest ingredients: fresh fruits and zests, Tahitian vanilla, premium hazelnuts, Quebec maple syrup, and, of course, only the very best chocolate. Then it’s off to the climate controlled ‘chocolaterie’ kitchen, which allows him to make precise, small batches – from the initial chocolate tempering process right through to the final garnish. Norwalk, CT (October 16, 2012) – With the holiday season kicking off at the end of the month, SMIRNOFF® Vodka is introducing two new flavored vodkas – Iced Cake and Kissed Caramel – giving adult consumers a reason to raise their glasses and celebrate every occasion this holiday season. As the world’s number-one selling and most awarded vodka brand, these decadent new flavors are the best way for consumers and fans of SMIRNOFF to honor every event, big or small. SMIRNOFF, the world's number-one selling premium spirit and the top-selling flavored vodka in North America, traces its heritage back to 19th century Russia. As the most awarded vodka brand in the world, SMIRNOFF has always been known for quality and is enjoyed responsibly in 130 countries around the world. 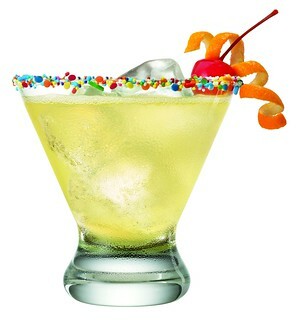 For more information, log on to www.SMIRNOFF.com. Diageo is a global company, trading in more than 180 countries around the world. The company is listed on both the New York Stock Exchange (NYSE: DEO) and the London Stock Exchange (DGE). For more information about Diageo, its people, brands, and performance, visit us at Diageo.com. For our global resource that promotes resposible drinking through the sharing of best practice tools, information and initiatives, visit DRINKiQ.com. Things are definitely getting squirrely this fall, as Hop City Brewing Company’s flagship beer, Barking Squirrel Lager comes to British Columbia. Hop City an award-winning craft brewery, is the brainchild of brewmasters Kevin Gray and John Gagliardi, two longtime brewers who created Hop City’s first recipe, Barking Squirrel Lager, in 2009. They were thirsty for a tasty brew that was flavourful and complex, yet sessionable at the same time. After making its mark in its hometown, the guys feel that now is the time to hop across the country and share the brew with beer lovers across Western Canada. Kevin and John craft beer that’s as dynamic as they are. They’re as comfortable coming up with new recipes as they are sweeping the brewery floor, ensuring their zeal comes through in each Barking Squirrel pour. Watch for Barking Squirrel Lager as it rolls out throughout Fall 2012, available in British Columbia at BCLBD locations, along with select bars and restaurants throughout the province. Barking Squirrel will be sold on draft and in package (473mL cans and 330 mL bottles). Vancouver, B.C. – Umbria – the romantic stories and sights of this landlocked beautiful region have been told to us through innumerable films, novels and paintings. Now, you can enjoy the bounty of this land with its fertile fields that result in the finest of meats and produce at Cibo’s Umbrian Regional Dinner on Wednesday, October 24 for just $48.00 (excluding taxes and gratuities). All palates will be enamored with the varied Umbrian cuisine – the very best in meat is showcased in pork where masterful butchers turn out sturdy sausages, salamis and hams. Strong cheeses, lentils and exquisite truffles will also take centre stage when Chef Faizal Kassam turns these old world ingredients into vibrant, rustic dishes using the best in local and sustainable produce. “Umbria presents a fantastic opportunity to showcase a wide range of dishes that are deep in flavor, but uncomplicated in their approachability,” says Chef Faizal. Umbria’s mild climate is also ideal for growing grapes and many superb red and white wines come from this region. Wine Director and General Manager Steve Edwards will be on hand to offer advice and wine pairings to enhance your dining experience. *** IN OTHER NEWS – we are delighted to announce that Cibo is now open for breakfast from 7 am – 11 a.m., and lunch from 11:30 am – 2:00 p.m., Monday through Friday. Brunch is served Saturday and Sunday from 7 a.m. - 2:00 p.m.
And in UVA – enjoy BUCK A SHUCK oyster’s everyday – plus on Sunday, you can enjoy $5.00 glasses of prosecco. About Cibo Trattoria – We proudly specialize in truly authentic Italian cooking made with fresh, local and organic ingredients. At Cibo, you will experience the honoured traditions and culture of Italy in a comfortable and welcoming ambience while savouring our award winning rustic cuisine. Our deep wine cellar is headed by Sommelier and General Manager Steve Edwards who will happily assist you with exquisite wine pairings to match the incredible food. Cibo was named Best New Canadian Restaurant for 2009 by the prestigious enRoute and Where magazines Cibo continues to collect accolades and regularly appears in the best places to eat lists. 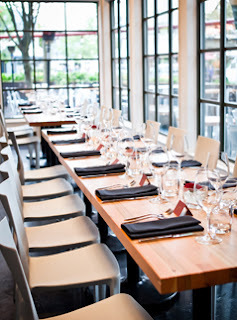 We are located in the Moda Hotel at 900 Seymour and are open for dinner nightly Monday through Saturday from 5:00 p.m. This autumn we are pleased to present five extraordinary wine dinners at Araxi, Blue Water Cafe, CinCin and West. Our award-winning chefs will craft multi-course tasting menus to complement each evening’s progression of wines. Senior representatives from select wineries will speak to the history and terroir of their estates and winemaking methods. Join Wine Director Andrea Vescovi as he welcomes Enrico Valleferro, Export Manager for Adami, to Canada’s first Prosecco-themed dinner. Adami has been recognized as the region’s benchmark producer by Gambero Rosso. This sparkling evening will feature an exquisite menu by Executive Chef Frank Pabst with commentary by Enrico Valleferro on the diversity of Prosecco. Join Wine Director Andrea Vescovi as he welcomes Mike Raffan, proprietor of Naramata’s Township 7 Winery, to Blue Water Cafe. Township 7’s winemaker Bradley Cooper is known for his artisanal approach to crafting fine wines—whereby minimal intervention in the winemaking process enables wines of character, grace and passion. Mike Raffan will introduce each wine, paired with a sensational ingredient-driven menu crafted by Blue Water Cafe’s renowned Executive Chef, Frank Pabst. Seven stellar wineries from the world's top wine regions will come together at Araxi for an exclusive one-off dinner event during Whistler's Cornucopia Festival of Food and Wine. Each critically acclaimed wine has been thoughtfully hand-selected by Wine Director Samantha Rahn and will be married to a bespoke seven-course menu by Araxi Executive Chef James Walt. For more information visit our website. Restaurant + Wine Director, Owen Knowlton, looks forward to welcoming Sandhill's legendary Master Winemaker Howard Soon to West. Howard is a 2012 BC Restaurant Hall of Fame Inductee and will be presenting reserve wines from Sandhill's Small Lots Program. The wines will be paired with a unique seasonal menu crafted by West Executive Chef Quang Dang. This spectacular evening will feature some of Antinori's top wines, including Guado Al Tasso and Tignanello - paired with a dedicated specialty menu from Executive Chef Andrew Richardson. Details to follow. On Friday, October 12, the very best of BC's culinary community will come together in support of two special causes: Bocuse d'Or Canada and Breakfast for Learning. Bocuse d'Or is the world's most prestigious culinary competition, and Breakfast for Learning is a national charity supporting school nourishment programs. Entitled Hot Chefs, Cool Jazz, the glamorous evening will feature spectacular tasting dishes from a number of Vancouver's hottest chefs, complete with live entertainment and live auctions. It will also to be Vancouver's first official introduction to Canada's latest Bocuse d'Or Chef, Chef Alex Chen, who will be representing his country at the international competition. Tickets are still available for this great cause. Competing at the level demanded by the Bocuse d'Or requires limitless patience, extreme dedication, and thousands of hours spent in training and coaching. First and foremost, though, it needs a chef who can compete shoulder to shoulder with the best chefs in the world and whose talents and unwavering commitment set him or her apart. For Canada, that chef is Alex Chen. Chef Chen fell in love with cooking while growing up in Vancouver. His career has taken him across North America with positions in some of the continent's finest hotels, including the Four Seasons Toronto, Four Seasons Chicago, and most recently as the Executive Chef of The Beverly Hills Hotel and Bungalows in Hollywood. Chef Chen resigned his position at the Beverly Hills Hotel to pursue his dream of representing Canada at the Bocuse d'Or, and now resides in Vancouver where he is madly preparing for the competition. After being named Canada’s Bocuse d’Or chef for 2013, he also assumed the role of Culinary Architect at Moxie's Grill & Bar. Moxie’s is the title sponsor of Bocuse d’Or Team Canada, and this position allows Chef Chen to prepare for the competition and also directly impact menu development and staff training for the national restaurant group. September 25, 2012 (Vancouver, BC) – Cactus Restaurants Ltd. is pleased to announce they will be opening the collection’s first restaurant in Ontario in 2013. The new, flagship location is situated in the heart of Toronto’s financial district and will showcase the best of West Coast casual fine dining. The globally-inspired and sustainably- sourced menu, designed by Executive Chef Rob Feenie will feature the best fresh, local ingredients. Cactus Club’s unparalleled design and exquisite collection of original art, including Canadian and international artists such as Andy Warhol, Jean Michel-Basquiat, and Louis Poulson provide a chic, yet comfortable setting for knowledgeable and personable service. The new Cactus Club Cafe will be located at 100 King Street West, in downtown Toronto. VANCOUVER, British Columbia – Liberty Merchant Company proudly presents its 21st annual Port & Chocolate Tasting. All proceeds from this “Tasting-in-the-Park” event is to benefit the Vancouver Rowing Club’s Amateur Sports Program. To date Liberty has raised $96,294 for this program. Sweet Ports, decadent chocolates, raffle prizes and excellent company await. Join us on Thursday September 27th, from 7:30 - 9:30pm at the Vancouver Rowing Club in Stanley Park. Tickets are $29.99 and available at all Liberty Wine Merchants locations. For more information on this and future events, please visit http://www.libertywinemerchants.com. MISSISSAUGA, ON—September 24— Just when you thought summer was over, Mucho Burrito keeps the heat going! Mucho Burrito, the fastest-growing Mexican restaurant chain in Canada, today announced that it has become the first national food chain to use the ghost pepper, one of the world’s hottest chili peppers, as part of its menu offering. 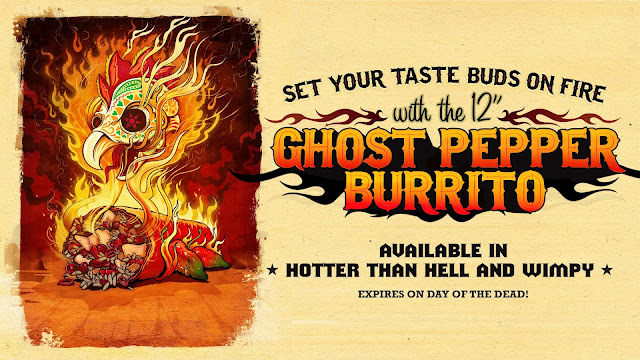 The limited-time Hotter than Hell and Wimpy 12 inch Ghost Pepper Burritos will be available today until November 2, the Day of the Dead, at Mucho Burrito locations across North America. The Ghost Pepper Burrito's two heat levels, Hotter than Hell and Wimpy, will put diners' taste buds to the test. The burritos are made with a combination of mouth-watering ghost pepper bacon, ghost pepper infused fig marmalade (sweet heat), spicy Mexican rice, salsa and a choice of meat, all wrapped in a fiery red tortilla. The Hotter than Hell Ghost Pepper Burrito will also be topped with an extra splash of Mucho Burrito’s hottest salsa and pure Ghost Pepper sauce. To turn up the heat, Mucho Burrito will also be giving away $25 gift cards daily during the month of October to consumers who post photographs of their “Ghost Pepper Experience” to the franchise’s Facebook and Twitter (@MuchoBurritoHQ) pages. Full contest details are available at http://www.facebook.com/MuchoBurrito. With a Scoville rating of 1,000,000, the ghost pepper is one of the hottest peppers in the world, with only one other pepper ranking higher. In comparison, well-known peppers such as the Habanero have a Scoville rating of 350,000, while the Jalapeno has a rating of 8,000. The ghost pepper has a slow-building heat that increases with intensity as time passes. It was rated the hottest chili pepper in the world by The Guinness Book of World Records. Mucho Burrito, part of the Extreme Brandz family of quick service restaurants, is dedicated to crafting the freshest and most flavourful quality Mexican food designed to stimulate guests’ senses. Co-founded by brothers Alex and Mark Rechichi, the first location was opened in Mississauga, Ontario in 2006. Today, there are more than 60 locations across North America. For more information, visit www.muchoburrito.com. Extreme Brandz is a leading Canadian quick service restaurant franchisor of Extreme Pita, Purblendz and Mucho Burrito. Based in Mississauga, Ontario, Canada, the company was created by brothers Alex and Mark Rechichi in 1997 with the opening of an Extreme Pita location in Waterloo, Canada. In addition to ranking in Entrepreneur magazine's list of top restaurant franchises in 2011, Extreme Brandz won the 2011 Company of the Year Pinnacle Award. Today there are 350 locations of the three brands across North America. For more information, visit www.extremebrandz.com. It is Oktoberfest at MARKET by Jean-Georges. We are proud to be serving Oktoberfest & Brau-Weisse Ayinger Beer brought in from Bavaria especially for the event, plus traditional Oktoberfest food favorites. LUNCH: Monday to Friday 11:30am – 2:30pm. Saturday & Sunday (except September 23 due to Farmers Market) 11:30am to 2:30pm. On the menu: Traditional Oktoberfest favourites like Leberwurst, Weisswurst, Pork Hock, along with Sauerkraut, Spatzle, Potato Salad & everyone's favourite pretzels! Visit us on Facebook or call us at 604 695 1115 for more information and tickets. Purchase of tickets required and non-refundable. Get them here. Vancouver, BC (14/09/2012) – The street food revolution has given rise to North America’s tastiest fleet of mobile eateries and social media has been one, if not the main driver in helping revolutionize the food truck industry. To further unite the food truck and technology communities while showcasing how both have embraced social media to further the street food movement, Invoke Media has teamed up with Social Media Week Los Angeles to host the Social Media Week Cross-City Challenge. The challenge will be held during Social Media Week Los Angeles, September 22-27, 2012. Invoke Media is a digital innovation company that created the Eat St. application with Paperny Entertainment to complement the popular Food Network television series. Through its work with Eat St. the company has leveraged mobile and social technology to help food trucks engage with local consumers and build out their business. Through the Social Media Week Food Truck Cross-City Challenge these technologies will be harnessed in four specific cities - London, Chicago, Los Angeles, Vancouver - to showcase just how the street food movement is being driven by social savvy consumers and vendors alike. Social Media Week Los Angeles is part of Social Media Week (September 24-28), a worldwide event that takes place in 14 cities and explores the social, cultural and economic impacts of social media. The Social Media Week Cross-City Challenge is built around sharing your favourite street food finds and feasts through tweets. Social media savvy food lovers in London, Chicago, Los Angeles or Vancouver can enter to win while rising to the cream of the social media crop. Participants who post text based tweets will receive 10 points. 20 extra points will be allocated to tweets that include a photo (uploaded via any means including Twitpic, Lockerz, Instagram etc.) 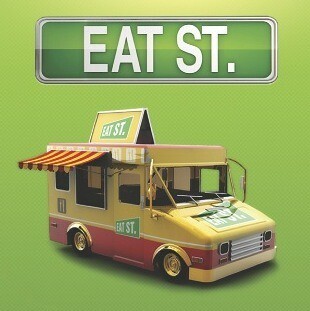 and 25 additional points will be allocated to tweets generated directly from within the Eat St. App. The Most Valuable Player (and prize winner) will be the person who shares the most street food tweets in their city! New quick-casual eats to shore up the Granville Street food scene. Vancouver, BC (September 13, 2012): Emad Yacoub and Shannon Bosa-Yacoub owners of The GLOWBAL COLLECTION are going overboard for laid-back, quick fare with their newest spot to eat -- The Fish Shack -- opening later this fall. With casual, sun-bleached surroundings and a chalkboard menu of satisfying comfort food, The Fish Shack hooks guests with value and fast, fresh fun food from exceptional suppliers. Think daily fresh fish specials, fish & chips, chowder in bread bowls, fish boils, po'boy sandwiches and shellfish galore. "We are excited by the possibilities of a new down-home direction," says Yacoub. "This is not fine dining; it is laid-back at every turn, from the jeans-clad service team to the menu to the decor. The Fish Shack is a place to catch a sports game while enjoying a beer and a relaxed meal." As for design, the expansive bi-level, 100-seat space is undergoing a renovation led by Vancouver's BOX Interior Design. Given the concept, a nautical theme is a natural fit. Deep marine-blue walls complement the lifejacket red upholstered banquettes with a quick-trip-to-the docks feel. A blackboard painted wall beside the bar and upstairs above banquette seating, shouts out the daily food specials. Diners will have to wait with baited breath for further details regarding the new space. Be on the lookout. The GLOWBAL COLLECTION is comprised of eight restaurants: glowbal grill steaks & satay, COAST Restaurant, Italian Kitchen, Trattoria Italian Kitchen, SOCIETY, Black+Blue, two IK2GO locations; and two lounges: AFTERglow and O Lounge. A ninth restaurant, The Fish Shack, will open fall 2012. The energy, bustle and allure of these celebrated Vancouver restaurants are what most people notice first. In addition, flawless service, exquisite wine lists, and some of the most inventive, celebrated cuisine in Vancouver define every restaurant in the collection. glowbalgroup.com. Enjoy the full wine country experience – in the city! BC VQA winemakers and winery proprietors will be at Edible Canada on Wednesday, September 19 for an intimate wine-paired dinner to discuss their latest fall releases. Hosted by Master of Wine Rhys Pender, dinner guests have the rare opportunity to hear about the wines directly from the winemaker and/or proprietor over a lavish five course meal (with eight paired wines)! These are THE authentic characters of BC wine - the owners and winemakers themselves will be on hand with first-hand knowledge and personal stories to share with fortunate guests. Chef Tom Lee looked to the abundance of fall harvest across Canada for inspiration in developing this special menu – one as characterful and unique as the wines and personalities themselves. Tickets are $75 (plus HST & s/c) are available online at winebc.com or phone 1-800-656-0713 and are selling very quickly. Remember Willy Wonka and The Chocolate Factory, and the hunt for the Golden Ticket? 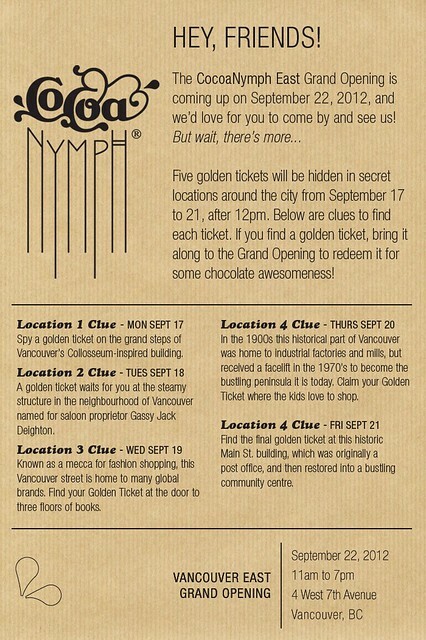 Well, CocoaNymph will be placing five Golden Tickets throughout Vancouver September 17-21, everyday after 12pm. The lucky finders will be able to redeem these tickets for "some chocolate awesomenss", and who couldn't use more of that in their lives! Take note of the clues provided below and make sure you are in the right place that day! The world famous, sublime region of Tuscany is the inspiration for Cibo Trattoria’s next Italian regional dinner on Wednesday, September 26. Known as the true birthplace of the Italian renaissance, Tuscans are naturally proud of their art, architecture, music and literature. With so much beauty amongst the rolling hills, Tuscans revel in the intense flavours of their cuisine which features simple food well presented. Think fresh breads, vegetables, cheeses, olive oils and meats – all perfect accompaniments to the region’s Chianti wines. Chef Faizal Kassam’s delicious menu reflects all that is native to this region. “The duck liver is prepared in a typical Tuscan way using anchovies and capers which do not usually appear in liver pates in other parts of Italy. Ask any Tuscan what signifies a true primi Tuscan dish and they would most definitely tell you the Pici style spaghetti. Our roast chicken panzanelle includes bread and the chianti vinegar which feature prominently in Tuscan cuisine. I’m also excited to use our local bounty with heirloom tomatoes and sweet Walla Walla onions. The peaches this season are the best I have ever tasted and they are a perfect match for Vin Santo” stated Chef Kassam. Wine pairings for the dinner will also be available. About Cibo Trattoria – We proudly specialize in truly authentic Italian cooking made with fresh, local and organic ingredients. At CiboTrattoria, you will experience the honoured traditions and culture of Italy in a comfortable and welcoming ambience while savouring our award winning rustic cuisine. Our deep wine cellar is headed by Sommelier and General Manager Steve Edwards who will happily assist you with exquisite wine pairings to match the incredible food. Cibo Trattoria was named Best New Canadian Restaurant for 2009 by the prestigious enRoute and Where magazines. Cibo Trattoria continues to collect accolades and regularly appears in ‘the best places to eat’ lists. We are located in the Moda Hotel at 900 Seymour and are open for dinner nightly Monday through Saturday from 5:00 p.m.
De Dutch - Vancouver Convention Centre is now open for Breakfast, Brunch & Lunch! 7am-4pm every day. To view our De Dutch Menu click there ← . This flagship location also offers daily specials such as breakfast bruschetta, sockeye salmon burgers or crab benedict’s from our in-house Chef, James Reekie. Come by for a full De Dutch Pannekoek or just some lighter fare and wine, a mimosa or a local beer on our signature waterfront patio. We are proudly featuring Granville Island Brewing, Stanley Park Brewery, Quails’ Gate Okanagan Valley, Summerhill Winery and Wild Goose Vineyards. Any of our “De-Licious” food on our menu is available for take away, or you can call ahead 15 minutes to be on “De-List” at lunch and we’ll see to it you’re served promptly. We also have a full espresso bar for lattes, cappuccinos and iced coffees to keep you going as you walk the waterfront! Our # is 604-647-7530. "We earn tomorrow's guests today"
To read my review from the Grand Opening, click! HappyWater,™ a new bottled lithia water, is launching at Canada’s largest independent comedy festival in Vancouver this week. Drawn from a rare lithia spring in B.C’s Rocky Mountains, HappyWater™ contains natural Lithia, which for centuries has been known to enhance an overall sense of well-being and stimulate the creation of new brain cells. Beginning July 9, 60 stand-up comedians from across the country will compete at Patrick Maliha’s People’s Champ of Comedy for a grand prize of $20,000. The competition takes place at various venues around Vancouver for a total of seven weeks. HappyWater™ will be served outside the venues and on site. Each drink purchased buys guests a ballot to vote for their favourite comedian. “We’re thrilled to be partnering with HappyWater™ for the fifth annual People’s Champ of Comedy Competition,” said Patrick Maliha, founder of the competition. “As a stand up comedian, there’s a sense of relief in knowing an audience is a little more primed to hear your jokes.” HappyWater™ is naturally alkaline and provides healthy hydration and minerals for brain and body renewal. It will be sold exclusively at comedy competition locations across Vancouver. I had a chance to sample Pura Agave™ Syrups, developed by Chef Themis Velgis with Bryan Kim and SFU undergraduate student Shahab Samimi. If Chef Themis sounds familiar, he opened Chocoatl back in 2004. “Pura was developed to provide a healthy alternative to sugar and artificial sweeteners,” says Chef Velgis, president and co-founder of Pura Foods. Pura Raw Agave is made with 100% natural ingredients, providing a delicious range of 15 certified organic flavoured agave syrups. Used for thousands of years in Mexico and prized by the Aztecs, agave syrup is 25% sweeter than sugar allowing consumers to use less and consequently reduce the amount of calories and carbohydrates consumed. Pura flavoured agave syrups contain the lowest glycemic index of Blue Agave, 17, a feat achieved by the unique processing style of the syrup. 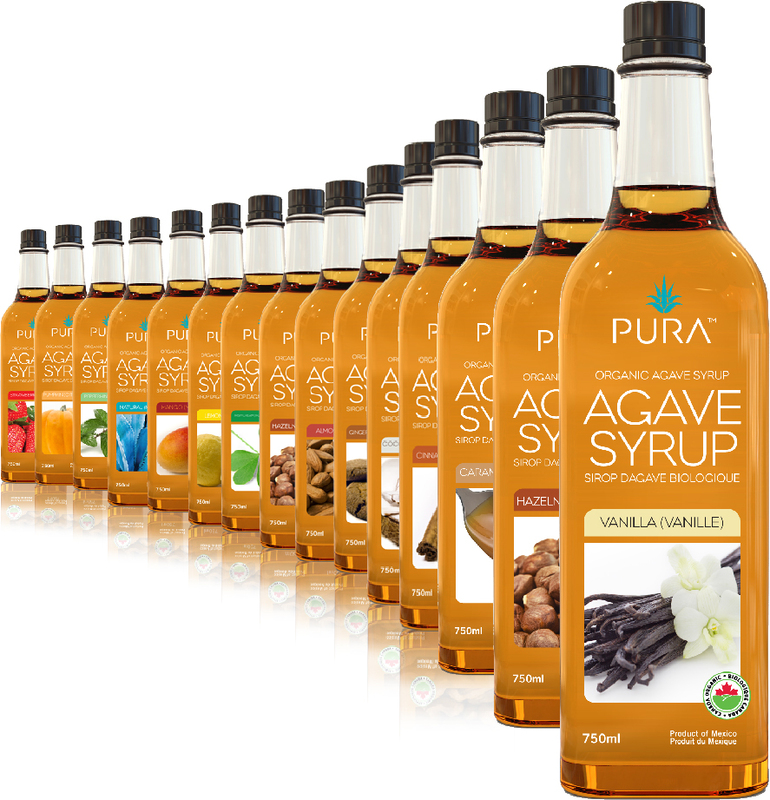 All of Pura Raw Agave Syrups are raw, meaning the syrup has not been heated above 46 degree Celsius, maintaining its enzymes and natural properties that may otherwise be affected by high temperatures. Its light viscosity allows the last drip to drop as easily as the first, dissolving quickly in hot and cold beverages. Ever had a refreshing vanilla latte or caramel macchiato made with organic beans? However, did you realize that every other component of your drink is non-organic and artificial? Matching the price of sugar based syrups; "Pura allows restaurants and coffee shops in the city of Vancouver to offer up organic and healthy products that cater to the lifestyle of Vancouverites," affirms Blenz Yaletown franchise manager Mathew. Here is my little bonus from this afternoon - a Blenz Iced Hibiscus Burst made with the Pura Agave, as well as a blueberry muffin, also made with Pura Agave. There are two vials as well of different Agaven syrup, one is Peppermint and the other is Mango. 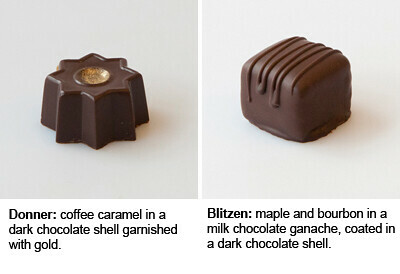 Drop by a Blenz near you to try out these new flavours, and then share your favourite one at facebook.com/PuraAgave. I think my favourite was the mango - perfect with a bit of water and a splash of vodka, served over ice. Summer is finally here and what a great time to start cooking the smart and healthy way! I just got word that world famous Ronco Rotisserie is having a giveaway. It is the perfect way to entertain rain or shine. Here is a picture of the bad boy they're giving away. 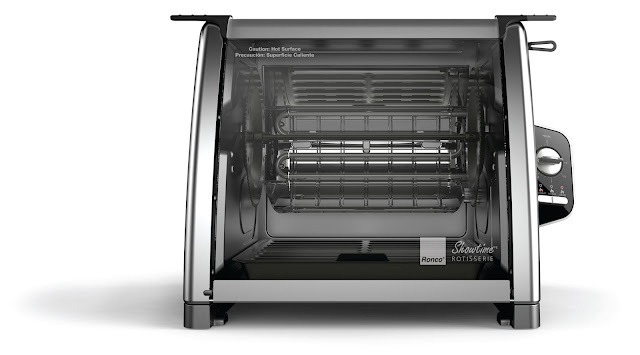 All you have to do is visit their Facebook page and click “Like”, you’ll be automatically entered to win this amazing Rotisserie valued at $199.99. Winners are drawn daily in July, so if you "Like" them today, that's 21 chances to win! Click here to go to their Facebook page. Winners will be announced the following morning of the daily drawing. (ie. Winners of the July 1st drawing will be announced on July 2nd.) Once we contact you and your order is taken you should receive your Rotisserie within 5 business days. The promotion began July 1st and ends July 31st.